Walmart of Bentonville, Ark., is recalling about 246,000 Ozark Trail camp axes. The axe head can detach from the handle, posing an injury hazard. The company has received two reports of axe heads detaching from the handle, resulting in minor cuts and abrasions. This recall involves Ozark Trail camp axes. The steel shaft tubular axes measure about 14 inches long from handle to axe head, and weigh about 1.25 lbs. The axes have a black, non-slip rubber grip and claw feature. “Ozark Trail” and model number 60111140 are printed on the product packaging. 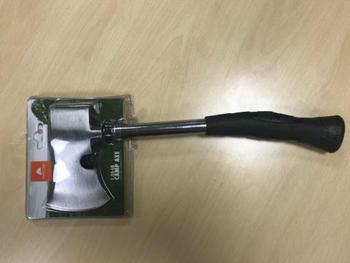 The camp axes, manufactured in India, were sold exclusively at Walmart stores nationwide and online at www.walmart.com from January 2017, through July, 2018 for about $8. Consumers should immediately stop using the recalled axes and return them to Walmart for a full refund. Consumers may contact Walmart at (800) 925-6278 from 7 a.m. through 9 p.m. (CT) any day or online at www.walmart.com and click on "Product Recalls" for more information.